Pay in Full and Receive $50 off a full year of Weigh Down All Access! That's UNLIMITED CLASSES for one full year via Streaming to every Weigh Down Class (Videos, Audios, downloadable workbooks) and class reinforcement materials. All Access Library: Audio & Video Lessons on more than weight loss including: parenting, marriage, finances, overcoming anger, depression, anxiety and content for teens and kids! In additon, you can request an accountability partner through info@weighdown.com, and join Online Class Chat Sessions throughout the year. Get the Truth plus a support team, and you will lose your weight quickly and permanently! Available to stream from any Internet-accessible device including desktops, laptops, tablets, & mobile devices! Adobe Flash Player is required for viewing on Desktop/Laptop. For a free download, CLICK HERE. Android and Apple Users: Download our App from your App Store and access Weigh Down All Access on the go! PayPal is currently not a payment option. 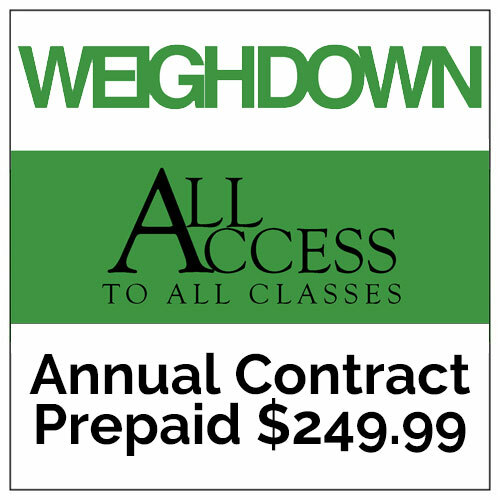 The cost for WeighDown All Access Year Upfront is $249. That is a $50 savings. You can choose to order 1 year or subscribe to renew yearly. There are no refunds for partial year(s) cancellations. If you have more than 4 members in your household who are actively using one account, we suggest you purchase a second account. Service begins as soon as your payment is processed. You’ll be charged the annual rate stated at the time of purchase as one lump sum. Your contract will renew automatically, on your annual renewal date, until you cancel. Renewal rates are subject to change, but you will be notified of any change in your rate with the option to cancel in accordance with these terms. If you cancel within 3 days of your initial order, you’ll be fully refunded. Should you cancel after 3 days, your payment is non-refundable and your service will continue until the end of your contracted term. Cancellations can be made by visiting your Your Account page or by contacting the Weigh Down office at 1-800-844-5208 and speaking with a representative.